Food trucks. Sidewalk repairs. Flower vendors. More downtown residential development. Retail at street level. Dog runs. Dedicated bikeways. Fountains and sprinklers for kids to play in. These are just a few of the dozens of ideas that the people of San Antonio contributed by visiting the online PlaceMap that PPS created as part of an ongoing engagement with the city's government and citizens to to help them bring back downtown as a vibrant, livable place for a new generation of residents. This interactive map, based on PPS’s core “Power of 10” principle, called on citizens to “Re-Imagine the Heart of San Antonio.” And they proved ready for the challenge. It’s all a great illustration of the way that online community engagement -- Digital Placemaking -- expands and enhances the work that PPS does face-to-face with community members and municipal officials to create great places and to plan for more livable, sustainable communities. ‍San Antonio's downtown is filled with unrealized Placemaking potential. Photo: Matthew Egan via Flickr. The PlaceMap was launched in June as one element of PPS's "Placemaking Academy" for San Antonio city officials. Acting as strategic advisers, PPS led the city's staff to completely rethink the way they think about planning -- not only in terms of community outreach, but in the way they work together, and also in the way they see the places around them. 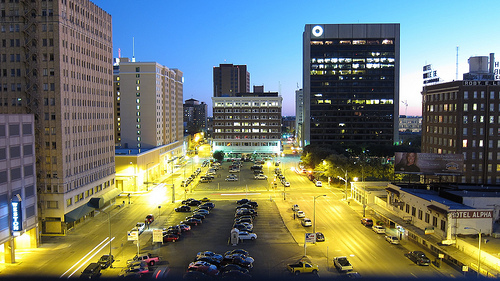 "PPS has really helped us to get our staff excited about Placemaking," says Lori Houston, assistant director of the Center City Development Office for the City of San Antonio. "They’ve done a great job with that." In August, the first phase of the PlaceMap project ended with citizens coming together in meetings at the library and at a “Views and Brews” event hosted by Texas Public Radio (TPR) to discuss the results. Participants sifted through, discussed, refined, and expanded on the varied concepts that had come up, including many that fit into the “Lighter, Quicker, Cheaper” (LQC) category. Now TPR is planning a new campaign to solicit more LQC ideas via the PlaceMap, then have a vote on which one should be implemented, find a sponsor, and make it happen. More and more cities are looking to enhance and open up their planning process, and Digital Placemaking is a great way to achieve that. In Baltimore, PPS added online mapping to the outreach mix to connect with a wider circle of voices, while making the community process more transparent. With the Institute for Urban Design in New York City, PPS launched a version of the PlaceMap that gathered ideas and raised awareness of urban design by leveraging the inherent “place-context” of online mapping. For San Antonio, getting to the next level of public involvement in planning is key. The PlaceMap is part of an overall strategy to achieve the city's goals of revitalizing its downtown in a holistic, community-led way. “I really think that the PlaceMap has given us an interface with the public that allows them to participate meaningfully,” says Houston. Houston added that being able to submit pictures was another real plus. By uploading images to the map, users can share their vision for the city’s public spaces in a very concrete way. Many of the San Antonio PlaceMap users illustrated their ideas with photos -- some from the streets they wanted to see improved, some from other communities whose successes they’d like to emulate. “People are saying, ‘I saw this in another city,’” says Houston. And if other cities can have these things, the implication is, why can’t San Antonio? Grojean is a lifelong San Antonian, and she is well aware of the problems faced by her city’s downtown. It’s a place that has for a long time held little appeal for residents. “Locals only go downtown when there are relatives in town who want to see the Alamo or the Riverwalk,” says Grojean, with a laugh. PPS’s Myrick says that the PlaceMap was a great way to spread the news about the Placemaking approach to revitalizing San Antonio’s downtown -- an effort that PPS has been involved with for several years now. Grojean says that for her and her colleagues at TPR, the community-led Placemaking process, enabled in this case by the PlaceMap, is a natural fit. We’ll be watching to see what the San Antonio community and TPR come up with in months to come, and we’ll keep you posted! Contact Josh Kent or Daniel Latorre if you're interested in incorporating Digital Placemaking into your community's Placemaking practice.